“As we increase our efforts to clean Malé, the amount of garbage dumped on to the street is also increasing,” said Mayor Mohamed Shihab. Speaking to Minivan News today, Ahmed Murthaza – assistant director at the Environmental Protection Agency (EPA) – said that no one had yet been fined under the regulation. Minivan News was unable to obtain a comment from Ministry of Finance at the time of press. Posted on May 20, 2014 May 21, 2014 Author Ahmed RilwanCategories Environment, Politics, Society & CultureTags barge, finance ministry, litter, maldives, maldives news, Male' City, Male' city council, Mohamed Shihab, Tatva, thilafushi, waste management12 Comments on Are efforts to keep Malé City clean going to waste? President Abdulla Yameen has appointed Imran Salih of Fehivilaage in the island of Hithadhoo in Addu City to the post of deputy minister of finance and treasury. Local media reports that Salih has a Masters Degree in finance from the International Islamic University of Malaysia and a Bachelors Degree in accounting from the Multimedia University in Malaysia. According to the President’s Office website, there are currently sixty other political appointees of the deputy ministerial rank. 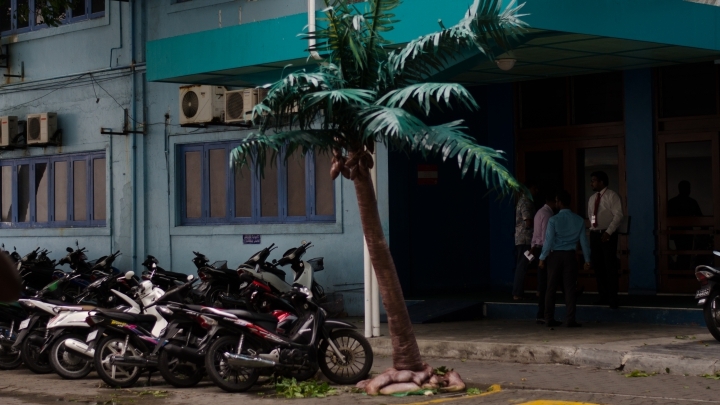 The government is owed MVR256.9 million (US$16.6 million) in unpaid dividends from state-owned enterprises, the audit report of the Ministry of Finance and Treasury for 2012 has revealed. In the report (Dhivehi) made public yesterday, Auditor General Niyaz Ibrahim recommended collecting the dividends within a period of one month. The unpaid dividends include MVR5.1 million (US$330,739) owed by Island Aviation Services, MVR78.9 million (US$5.1 million) owed by the Malé Water and Sewerage Company, MVR167.8 million (US$10.8 million) owed by the State Trading Organisation (STO), and MVR5 million (US$324,24) owed by the Maldives Transport and Contracting Company (MTCC). The auditor general also recommended regularly monitoring the finances of government-owned companies, seeking audited financial statements within six months of the end of the financial year, and collecting dividends without delay. While the ministry was required to submit a consolidated financial statement for 2012 inclusive of the departments operating under its remit, the report noted that the ministry prepared separate statements for itself and the departments. Moreover, the annual financial statements did not include details of loans and foreign aid, the report stated. As the auditor general was therefore unable to offer his professional opinion on the financial statements for 2012, he recommended taking action against the responsible financial officer under articles 47 and 48 of the Public Finance Act for the lapse. Among other issues flagged in the report, auditors found that the Finance Ministry spent MVR858.5 million (US$55.6 million) out of the budget code assigned for providing capital to government-owned corporations. The funds were released in violation of the constitution, the Public Finance Act, and regulations under the law, the report stated. The funds earmarked for capital expenditures of government-owned corporations in the 2012 state budget was MVR30.4 million (US$1.9 million), the report noted. Of the funds released as capital for government-owned companies, auditors discovered that MVR840.6 million (US$54.5 million) was used to pay salaries for board members and staff and to cover other recurrent expenditures. The ministry’s actions defeated the purpose of allocating funds for specified expenditures in the budget, the report stated. As state-owned enterprises were not required to comply with public finance regulations, the report warned that releasing the funds could be “wasteful” or “facilitate corruption” in the absence of a mechanism for holding senior officials of the companies accountable for expenses. Moreover, falsely including such a large amount of money as capital expenditures in the annual financial statement was “a serious deception,” which casts doubt on validity of the statement, the report noted. The auditor general recommended taking legal action against the officials responsible for authorising the release of funds to the state-owned enterprises, which included health corporations, utility companies, regional airport companies, the Bank of Maldives, the State Electricity Company, STO, MTCC, Aasandha, and Fuel Supply Maldives. The auditor general also cautioned against corporatisation of government services without assessing feasibility and determining financial and administrative challenges. In another case highlighted in the report, auditors were unable to verify whether MVR254,898 (US$16,530) worth of expenses for overseas trips by senior officials were made for state purposes. The Finance Ministry refused to share documents related to the trips “despite repeated requests,” the report stated. The auditor general recommended that the expenses should be further investigated by the Anti-Corruption Commission. Auditors also discovered that the Finance Ministry purchased a number of items without a bidding process in violation of public finance regulations, which requires a public tender for procurement of items worth MVR25,000 (US$1,621) or higher. The items included a Macbook Air, two coffee machines, an air-conditioner, eight computer systems, and one iPad. Meanwhile, in November 2012, a senior project officer at the Ministry of Home Affairs was hired as a consultant for the Finance Ministry to formulate projects for a period of two months. While an announcement seeking a consultant was made on November 18 and an employment contract was signed on November 21, auditors found that the consultant began working at the ministry on November 12. Auditors could not find any documents showing that the consultant worked on the projects during the contract period. Moreover, in December 2012, Finance Minister Abdulla Jihad asked the ministry’s human resource committee to create a post for a project designer at the minister’s bureau. The Civil Service Commission (CSC) was requested to create the post on December 24 despite misgivings of members on the human resource committee, the report stated. When the job announcement for the ‘director project designing’ was made on December 27, the report noted that only one person applied for the post. The interested candidate was the same individual previously hired as a consultant, the report revealed. The unnamed individual was appointed to the post on January 28. The auditor general recommended that the case should be investigated by the ACC as the hiring of the consultant constituted abuse of authority to benefit a third party. Finance Minister Jihad – who was appointed to the post in February 2012 following the controversial transfer of presidential power – has meanwhile denied the allegations in local media. Jihad told newspaper Haveeru that the project director post in question was a civil service job, over which he did not have hiring or firing powers. “It is done in accordance with the rules by the relevant officials at the ministry. I don’t get involved in such matters. The auditor general releasing such a report is very irresponsible,” he was quoted as saying. Jihad has also previously criticised the auditor general over a report released in December which concluded that an MVR300 million loan was secured in 2012 from the Bank of Maldives in violation of public finance laws. The Ministry of Finance and Treasury last week instructed all government offices to enforce cost cutting measures in a bid to reduce recurrent expenditures and manage government cash flow. A circular issued by Finance Minister Abdulla Jihad instructed offices to limit overtime pay to no more than five percent of the office’s annual budget. Other cost cutting measures included targeting subsidies, limiting allowances to 35 percent of an employees’ salary, and not covering phone expenses of senior officials – with the exception of cabinet ministers. Moreover, offices were instructed not to hire speedboats for official travel in areas with a ferry service. Finance Minister Jihad told local media this week that the government has also decided to reduce the MVR80 million (US$5 million) allocated in this year’s budget for civil servant’s salary bonus to MVR40 million (US$2.5 million). In December, parliament passed a record MVR17.5 billion (US$1.16 billion) budget for 2014, prompting President Abdulla Yameen to call upon the legislature to approve revenue raising measures proposed by the government. On Sunday, parliament accepted with a 38-vote majority three bills submitted by the government to raise additional revenue. The bills included an amendment to raise the Tourism Goods and Services Tax (T-GST) from eight to 12 percent as well as two amendments to the Tourism Act in order to reintroduce the discontinued flat US$8 bed tax and to require resort lease extension payments to be paid as a lump sum. An 11-member subcommittee chaired by business tycoon Gasim Ibrahim – leader of the government-aligned Jumhooree Party – is currently in the process of reviewing the government-sponsored legislation. The committee met representatives of the Maldives Association of Travel Agencies and Tour Operators (MATATO) and the Maldives Association of Tourism Industry (MATI) today to discuss the impact of the tax hikes on the sector. Following the Majlis’s failure to extend the tourism bed tax before the end of last year, Jihad told local media that the resulting shortfall in revenue would be MVR100 million a month. In an interview with Minivan News last week, Tourism Minister Ahmed Adeeb criticised parliament for going into recess without passing bills designed to generate income. “This causes the budget to expand, but there’s no way for the government to earn enough to implement it. The T-GST matters even more to the state income. The state keeps expanding, the allowances and salaries keep increasing, but the income for all of this still depends on the 25,000 tourist beds. Unless we expand this, how can we increase what we earn? We can’t keep expanding the state, and then squeezing the existing tourism sector without expanding it,” Adeeb warned. Shortly after assuming the presidency, Yameen announced that he would only draw half the presidential salary of MVR100,000 (US$6,500), and would reduce the number of political appointees at the President’s Office. Submitting the 2014 annual budget to parliament last year, Jihad noted that recurrent expenditure (MVR12 billion) accounts for 73 percent of the total budget, with almost half spent on salaries and allowances for state employees in addition to administrative costs, interest payments and subsidies. Jihad advised implementing a raft of austerity measures, contending that the “expensive” public management model adopted in the Maldives was inappropriate for a small island state. Almost 50 percent of government income was spent on employees, Jihad observed, advising revision of the state pension system and reduction of the numbers of island and atoll councillors as well as members of independent institutions and boards of government-owned companies. In its professional opinion on the 2013 budget, the Auditor General’s Office stated that a policy of population consolidation together with effective measures to reduce the public sector wage bill was necessary to rein in the continuing fiscal deficits. In November last year, Najeeb told parliament’s finance committee that the public bank account was overdrawn by MVR1.5 billion (US$97 million) as a result of having to finance government expenditure. “When we have to accommodate every request by the government we are forced to act completely against the MMA law,” he said, referring to printing money. Jihad explained to MPs on the committee that the government was forced to approach the MMA because foreign banks were refusing to buy or rollover treasury bills. While MVR500 million (US$32 million) a month was needed to pay salaries and allowances for state employees, government income in some months was just MVR300 million (US$19 million), Jihad noted, leaving no option but turning to the central bank. The Anti-Corruption Commission (ACC) has asked the Prosecutor General’s (PG) office to press corruption charges against former Finance Minister Ahmed Inaz, former Maldives Airports Company Ltd (MACL) Chairman ‘Bandhu’ Ibrahim Saleem, and former members of the company’s board of directors. The senior officials of the Maldivian Democratic Party (MDP) government are accused of incurring financial losses to the state by amending the concession agreement with Indian infrastructure giant GMR to develop and manage the Ibrahim Nasir International Airport (INIA), the ACC said in a statement today. The agreement was changed upon request by the Finance Ministry to reduce the concession fee on jet fuel sales from 15 percent of revenue to one percent, resulting in a shortfall of MVR53.8 million (US$3.5 million). The ACC investigation found that the finance ministry disregarded professional advice over changing the clauses. In addition to two counts of corruption charges, the ACC also asked the PG office to seek damages from the former minister, chairman, and board members as the alteration was approved with unanimous consent of the MACL board. Along with Inaz and Saleem, former board members Mohamed Ibrahim of H. Noomuthy, Mohamed Waheed of Ma. Fehiali, Ahmed Murad of Ma. Bluegrass, Mohamed Shaz Waleed, Mohamed Shafeeq Mahmood of G. Meadow, and Adam Rasheed Ahmed of G. Thalvaaruge are also facing prosecution. GMR, in a consortium with Malaysia Airports Holding Berhad (MAHB), narrowly won the International Finance Corporation (IFC)-managed bid for the airport in 2010, and signed a 25-year agreement with MACL under the government of former President Mohamed Nasheed. The then-opposition, including the Progressive Party of the Maldives, Jumhooree Party, Dhivehi Rayyithunge Party and Adhaalath Party, opposed the agreement primarily on nationalistic grounds, and alleged corruption in the bidding process. Following the controversial transfer of presidential power in February 2012, after which opposition parties assumed control of the government, the administration of President Dr Mohamed Waheed declared the concession agreement ‘void ab initio’ (invalid from the outset), and gave GMR seven days’ notice to leave the country. Meanwhile, in December 2012, the ACC sought corruption charges against former Finance Minister Mohamed Shihab and the MACL chairman over the decision to allow GMR to deduct a US$25 Airport Development Charge (ADC), stipulated in the contract, from concession fees owed to the state. A report by the Auditor General found that concession revenue due the government had plummeted fourfold as a result of a Civil Court ruling that blocked the developer’s charging of of the US$25 ADC, on the grounds it was a tax and therefore required parliamentary approval. According to the report, net concession revenue to the government had fallen to just US$6,058,848 in 2012, compared to US$25,424,877 in 2011. The government received US$525,355 from the airport for the first quarter of 2012, compared to the US$8.7 million it was expecting. In the second quarter GMR presented MACL with a bill for US$1.5 million, and in the third quarter, US$2.2 million. The Auditor General’s report acknowledged allegations of corruption in the deal, but finding the evidence “not conclusive on this point”, deferred to the judgement of the ACC. On June 17, 2013, the ACC released a 61-page investigative report that concluded that the bidding process was conducted fairly by the IFC, and that the GMR-MAHB consortium won the contract by proposing the highest net present value of the concession fee. The ACC further concluded that the awarding of the contract did not contravene amendments brought to the Public Finance Act requiring parliamentary approval for such agreements. Furthermore, “Considering the situation (2008, 2009 and 2010) when the decision was made to privatise the Male’ International Airport,” the ACC’s calculations showed that MACL would make a profit of about US$254 million in 25 years if the airport was operated by the government-owned company. In June 2013, GMR filed a claim for US$1.4 billion in compensation at a Singapore arbitration court for “wrongful termination” of the US$511 million concession agreement. Upon his return from an official visit to India this month, President Abdulla Yameen said that the government was seeking an out of court settlement with GMR before the arbitration process begins. Amendments to the 2014 state budget could not be submitted as scheduled today, Finance Minister Abdulla Jihad has stated, delaying the submission process for the fourth time. The budget – submitted by the outgoing administration of President Dr Mohamed Waheed – has been undergoing amendments in accordance with the aims of the new government of President Abdulla Yameen. Jihad – finance minister under both presidents – told local media today that although the final draft cannot be submitted to parliament today, the majority of the work had been completed. He stated that the main reason for the delay was that the government had so far not provided enough details about some projects they wished to include in the budget. Jihad asserted that a final draft of the budget with all the required amendments will be ready for submission by Sunday, December 8. The Finance Ministry has stated that issues such as decreasing overtime allowances and non-profit allowances, and revising conditions for the provision of subsidies will be reviewed when submitting the newly amended budget. President Yameen has expressed concern over the economic vulnerability of the Maldives and pledged to reduce state expenditure by MVR1 billion (US$64.9million). “State debt is sky high. The state budget’s expenses are extremely high. Hence, we have to prioritise reducing state expenditure. I will start work very soon to reduce budget expenses,” Yameen said during his inauguration speech. The Maldives Monetary Authorities’ (MMA) most recent quarterly review noted that Government finances had “further deteriorated in the first six months of 2013” due to a sizeable shortfall in expected revenue coupled with a marked increase in recurrent expenditure. While the delay has brought the work of Parliament’s budget committee to a temporary halt, Speaker of Parliament Abdulla Shahid has instructed the committee to submit its final review report on the budget to the Parliament floor by December 15. Elsewhere, the Public Accounts Committee has today passed a proposal for the government to obtain a US$29million loan from the Bank of Ceylon as annual budget support and submitted it to the parliament. The loan request was submitted by the Waheed administration in September. The Public Accounts Committee report outlines that the loan is to be paid back by the government in a period of six years. The loan has a grace period of one year, after which a monthly payment of US$490,000 has to be paid to the Bank of Ceylon. The committee has passed the proposal for the loan despite it having an 8% interest rate – the parliament had previously decided that any loans taken by the government must have an interest rate of no higher than 7%. Earlier this week Indian media reported that the country would soon be releasing a further installment of the US$100million standby credit facility.